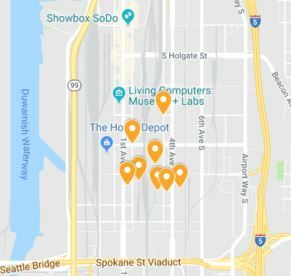 A series of set fires occurred in the SODO neighborhood beginning late in the evening on March 24 and continuing through the early morning hours of March 25. A dumpster receptacle, garbage bin, construction materials and two forklifts were damaged from the fires. Combustibles next to a building were set in two of the fires. Fortunately, there were no reported injuries and no significant property loss. Fire investigators responded to each scene to conduct an investigation, and determined they were intentionally set. The Seattle Police Department will conduct the follow-up investigation, and determine if the fires are related. Please report any information you believe may be related to arson to SPD’s Arson and Bomb Squad at (206)-684-8980. Persons providing information may remain anonymous. 2700 Blk. of Occidental Ave S.
2700 Blk. of 1st Ave S.
3300 Blk. 2nd Ave S.
200 Blk. of S. Hanford St.
Occidental Ave S. and S. Lander St.
2900 Blk. of 4th Ave. S.
Secure home, garage areas and businesses by locking doors and windows. Clean up wastepaper, grasses, weeds, litter, or anything that can burn from around buildings. Clear carport areas of all combustibles. Locate dumpsters, recycle bins and yard waster containers at least five feet away from walls and roof eave lines. If possible, keep them in a secured area. Do not all them to become overfilled. Place locks on commercial dumpsters or keep in secured area. Locks may be available through your contracted service provider. Use only metal or metal-lined receptacles. Residential customers can call Seattle Public Utilities at (206)-684-7665 to arrange for delivery and installation of locks for recycling and garbage containers. Trim shrubbery from doors and windows to improve visibility. Install motion-sensor exterior lights or consider leaving on. For businesses, check fire and life safety systems, including fire extinguishers, to ensure they are working and in compliance with codes. For homeowners, test smoke alarms to ensure they are working. Develop and practice a fire escape plan. Be sure it includes knowing all the exits and a meeting place. If you have a fire extinguisher, know where it is located and how to use it. Keep exit ways clear of items, which could slow evacuation efforts.